One of the best laughs I have had all day! Bunions? wow had I know I would be slippin' mine into Haiku's a long time ago LOL! 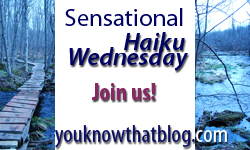 Now I KNOW you are a haiku master! I haven't been posting a lot either--summer is a busy time! Sounds like a handful....feel better soon! if you have time, my SHW post is here. Get Better Soon - We'll Be Here! Stu, please go get Stephanie some wine. And chocolate. And Mark Wahlberg.